Lennox Lewis is a retired heavyweight world champion boxer. Before he turned professional, Lewis won gold in the super-heavyweight category for Canada at the Olympics. Who is Lennox Lewis, how old is he, when is his birthday, how tall is he, where is he from and what is his background? Lennox Lewis was born on September 2 1965 and is 53 years old. He’s 1.96 metres tall and has dual British/Canadian citizenship. The boxer was born in London, but he moved with his family to Canada at the age of 12. He was very athletic at school, playing basketball, soccer and Canadian football. At the age of 18, he represented Canada at the Olympics, making it to the super-heavyweight boxing quarterfinals. He delayed turning professional in an attempt to win a gold medal and so was able to compete and win at the 1988 Olympics. After winning his medal, he returned to the UK and started to train as a professional boxer. Why is Lennox Lewis famous and what is his occupation? Lennox Lewis is a retired heavyweight boxer, known for his fights with Mike Tyson, Evander Holyfield and Vitali Klitschko. What is Lennox Lewis’s net worth? Sportstardom.com rank Lennox Lewis as the fifth richest boxer of all time, with a net worth of around $135million. How much does Lennox Lewis earn? The former heavyweight boxing champion won £84million over 14 years as a professional boxer. In 2002 he was paid $30million for his fight with Mike Tyson, plus an extra $335,000 compensation – paid by Tyson – for biting Lewis at the press conference. Some more pics from our #championslifestyles event on Thursday. I'm always happy to get together with new and old friends and have a great time. It was a night of celebration, success and gratitude and I was blessed to share it with so many of my friends. Looking forward to the next one. How much does Lennox Lewis weigh? Lewis’ weight has fluctuated from 224 to 256 pounds or 101 to 116kg. Is Lennox Lewis married, who has he dated in the past, was he married, who is his wife? The British fighter married Violet Chang, a former Miss Jamaica runner-up, in 2005. They have three daughters and a son. Where is Lennox Lewis now, did he suffer from any long-term injuries or illnesses, is he an all-time great? He now splits his time between his homes in Hertfordshire, Jamaica and Florida. He’s regarded by many as one of the greatest heavyweight boxers of all time, and The Ring magazine have said he’s the greatest heavyweight of the last 30 years. He’s remembered for his record of 44 fights, of which he won 41. There are no suggestions Lennox Lewis has suffered from mental illness, however his 1997 fight with Oliver McCall was stopped when McCall appeared to have breakdown in the ring. Does Lennox Lewis have any children? The champion boxer and his wife Violet Chang have four children; Landon, Ling, Leya and Leviah. 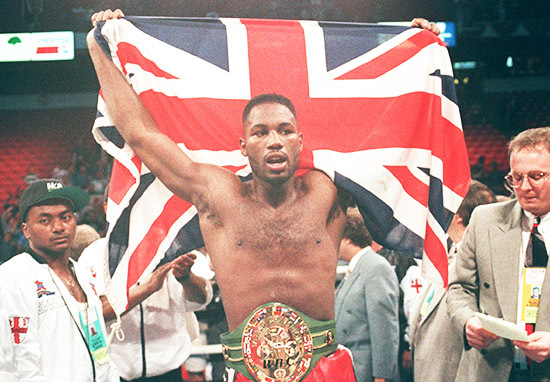 Who has Lennox Lewis fought in boxing matches, how many fights has he won, what are his most famous fights? Lennox Lewis has fought 44 professional bouts, winning 41, drawing one and losing two. Lewis knocked out Canadian Donovan ‘Razor’ Ruddock in October 1992 after two rounds. This fight was one of Lewis’ impressive wins to date and set him up as one of the world’s best heavyweights. After this he fought Tucker, Bruno and Jackson before meeting Oliver McCall in 1994. In the second round, McCall knocked Lewis down and even though Lewis got up, the referee felt he was dazed and called the fight. Lewis rebuilt his reputation after the loss and met McCall for a rematch in 1997. Unfortunately, during the fight, McCall appeared to have a mental breakdown and the fight was called for Lewis in the fifth round when McCall couldn’t continue. Lewis fought Evander Holyfield twice in 1999, scheduling a rematch after their first match was controversially declared a drawn – even though all the statistics favoured Lewis. Lewis went on to win the rematch on points and became the undisputed heavyweight world champion. My lovely wife. A tall cold beer. A great view of the Grand Prix. Yes…..Life is good! ?? In 2001 Lewis was knocked out by Hasim Rahman but enforced his contractual right to a rematch and was able to knock Rahman out and regain his title later the same year. In 2002 he beat Mike Tyson on points causing George Foreman to declare Lewis the best heavyweight of all time. At the time, the bout was the highest grossing event in the history of pay-per-view television. For his final bout before retirement, Lewis fought Vitali Klitschko. He won the fight when Klitschko was forced to retire by doctors after he sustained a severe cut over his eye in the sixth round.